On Monday, US Secretary of State John Kerry visited the Japanese city of Hiroshima, the target of the first nuclear bomb ever used in wartime. On August 6, 1945, the United States dropped an atomic bomb on the city, killing between 70,000 and 146,000 civilians outright. Three days later, on August 9, the US dropped a second nuclear bomb on the city of Nagasaki, killing a further 39,000 to 80,000 civilians. The Obama administration made clear that Kerry, the highest-ranking US official ever to visit the city, was not coming to apologize for these terrible crimes. the State Department said Monday. Declaring that “the peaceful, stable international system that we have built in the decades since World War II are not a given,” Kerry said the bombing of Hiroshima “reminds everybody of the extraordinary complexity of choices in war and of what war does to people, to communities, to countries, to the world.” He did not seek to reconcile this hypocritical statement with the fact that he is a representative of the state responsible for the crime. Kerry’s visit took place against the backdrop of a major escalation of Washington’s belligerent actions against China. Not since the Cuban missile crisis of 1962 has the danger of war and the use of nuclear weapons been so acute. Last week, the New York Times reported that the United States was preparing a third “freedom of navigation” operation in the South China Sea, in which the US will send a warship within 12 nautical miles of territory claimed by China. Admiral Harry Harris, the head of the US Pacific Fleet, has been agitating behind the scenes for the next such action to include “military” operations, potentially including the firing of weapons. As Kerry was speaking, US Defense Secretary Ashton Carter was in the midst of a visit to India, which the US is seeking to integrate into its anti-China alliance. From there, Carter will move on to the Philippines, which is receiving hundreds of millions of dollars in exchange for its cooperation in the US war drive. Carter will visit a location less than 100 miles from the disputed Spratly Islands archipelago claimed by China. Japan, together with Australia, forms the linchpin of Washington’s anti-Chinese alliance. To this end, the US has encouraged the aggressive remilitarization of Japan, promoting the very tendencies that led to the deaths of millions of people and horrendous war crimes during Japan’s invasion of China and other countries in the Pacific in the 1930s. Earlier this month, a reinterpretation of Japan’s pacifist constitution, agreed to in 2014, went into effect, allowing the Japanese military to fight wars abroad in support of its allies, including the United States. Last week, Japan’s Prime Minister Shinzo Abe said the country’s constitution did not prohibit it from possessing nuclear weapons. The deepening US-Japanese anti-China alliance is at the heart of a sweeping remilitarization of the Asia-Pacific region, where military spending increased by six percent last year. The Philippines and Indonesia, key US allies in the gang-up against China, increased their military spending by 25 percent and 16.5 percent, respectively. In his remarks, Kerry praised President Barack Obama’s efforts “to create and pursue a world free from nuclear weapons.” In reality, despite Obama’s vow early in his presidency that the US would “not develop new nuclear warheads or pursue new military missions or new capabilities,” the US government is in the midst of a $1 trillion program to upgrade its nuclear stockpile. In 2011, the latest year for which figures are available, the US spent $61.3 billion on its nuclear weapons program, more then all other countries combined. The amount was nearly 10 times more than China and almost 100 times more than North Korea. Despite claiming in 2009 that it would “reduce the role of nuclear weapons in our national security strategy,” the White House made explicit in a 2010 strategy document that the US military maintains the right to use nuclear weapons without being attacked, including against countries that do not possess nuclear weapons themselves. 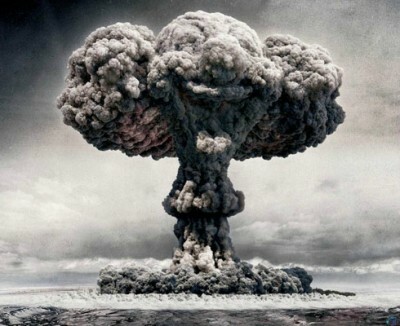 Behind the scenes, the US military, politicians and think tanks are drawing up plans for a preemptive nuclear strike. A report published last month by a leading policy think tank, entitled “Rethinking Armageddon,” elaborates scenarios in which the United States carries out nuclear first strikes against both North Korea and Russia. In this context, Kerry’s visit must serve as a warning to the working classes of Asia and the entire world. The use of nuclear bombs against Hiroshima and Nagasaki, under conditions in which the Japanese government was actively seeking terms of surrender, was not, as the official US narrative claims, a measure to hasten the end of the war. Rather, the nuclear incineration of hundreds of thousands of people was intended to communicate, particularly to the Soviet Union, that the United States would stop at nothing to secure its hegemony in the postwar order. Today, the United States, wracked by internal maladies and facing the protracted decline of its economic power, has only one trump card to secure its preeminent place in the global capitalist pecking order: the threat to use its enormous military and nuclear arsenal. This makes the danger all the more acute. Workers and young people across the world must take a warning from these developments, which threaten the very existence of human society. The struggle against war depends on ending the capitalist system, which is its source.